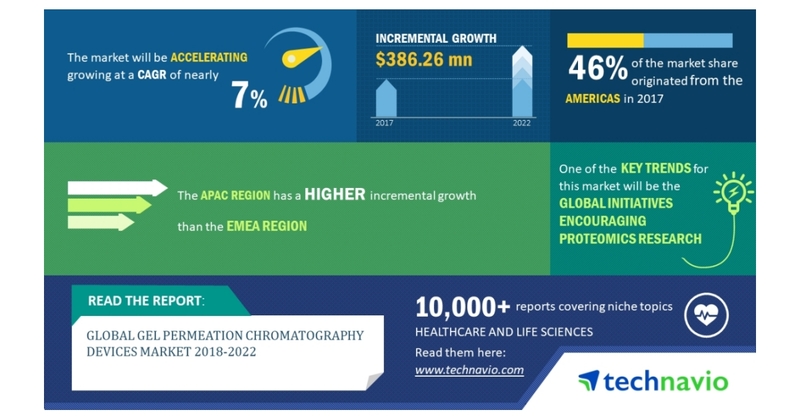 LONDON–(BUSINESS WIRE)–The global gel permeation chromatography devices market 2018-2022 is expected to post a CAGR of close to 7% during the forecast period, according to the latest market research report by Technavio. A key factor driving the growth of the market is an increase in the patent expiration of drugs. At present, several global pharmaceutical companies are facing various off-patents on big selling products, and this trend is likely to continue during the forecast period. During the patent protection period, only the original manufacturer (the one who has a patent for the drug) can produce and sell the drug. But once the patent expires, other manufacturers submit an abbreviated new drug application (ANDA) to the Food and Drug Administration (FDA) for the approval of generic version of drug and biosimilar products. This market research report on the global gel permeation chromatography devices market 2018-2022 also provides an analysis of the most important trends expected to impact the market outlook during the forecast period. Technavio classifies an emerging trend as a major factor that has the potential to significantly impact the market and contribute to its growth or decline. Collaborations between research and academic institutions across the world are creating efforts to understand and fine-tune proteomics research by studying proteins in greater detail through the exchange of knowledge and molecular biology techniques. “In 2014, a groundbreaking global project on protein research was launched and was called the Human Proteome Project. This project was created to mirror the success of the Human Genome Project, and the research is still going on in the project. The Human Proteome Organization is an international consortium of national proteomic research associations, government researchers, academic institutions, and industry partners, which is facilitating and serving as the mediator in this project. The project's goal is to experimentally observe all the proteins produced by the sequences translated from the human genome,” says a senior analyst at Technavio for research on human-machine interface. This market research report segments the global gel permeation chromatography devices market by end-user (pharmaceutical and biotechnology companies and academic institutions and research laboratories) and geographical regions (APAC, EMEA, and the Americas). The Americas led the market in 2017 with a market share of around 46%, followed by APAC and EMEA respectively. The dominance of the Americas can be attributed to the advances in the chemical and pharmaceutical industries.